Koninklijke Tichelaar B.V. (1572) is the oldest company in the Netherlands and worldwide a concept in the field of ceramics and glazes. Over the centuries we have built up an invaluable source of knowledge and expertise and the proven sustainable properties of the material, the timeless beauty and the cultural added value of our products are more current than ever. These qualities have a great appeal to contemporary architects, artists and designers and, together with them, Tichelaar is looking for new application areas and possibilities. Despite the new direction we have taken, we will continue to produce a limited collection of our famous traditional decorative pottery and tiles. You can find our fine ceramics in the webshop. A number of designs from our design collection are now among the icons of Dutch design history, and our collaboration with architects also provides special designs that receive a lot of attention at home and abroad. The map of the atlas of Caspar Robles from 1572 indicates at the location of the now former factory of Koninklijke Tichelaar a 'briccaria' or brick factory and is thus the oldest proof of our long history. Economic and technological changes have never alienated Tichelaar from her craftsmanship. Clay and glazes are still the most important raw materials that the company uses. For many of the production methods, such as hand painting and the century-old and superior seventeenth-century faience technique, known for its Delft earthwork, Koninlijke Tichelaar remains the only factory in Europe. This can also be said of the great knowledge in the manufacturing of glazes. Nurtured by our rich history and expertise, and gifted with a great curiosity, we are constantly looking for a contemporary solution to design challenges from architecture and design. 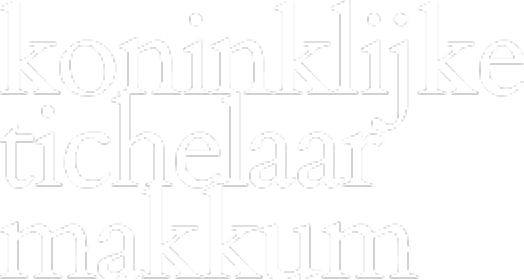 Koninklijke Tichelaar B.V. has consciously opted for the continuation and innovation of the knowledge and craft skills present in the company. Industrialization and far-reaching rationalization have caused an impoverishment of the ceramic market supply in the last century. Globally, in the 19th century, traditional techniques disappeared from the industrial production process. Koninklijke Tichelaar is one of the few remaining companies in the world that has always continued to invest in the traditional production processes and thanks to this tenacity we now have a vanguard position that we are proud of. Developments in contemporary architecture and design show us that there is an increasing need to explore the boundaries of ceramics and glazes. Experiment and research are anchored in the history and mentality of our company and the available knowledge enables Tichelaar to respond to the needs of architects, artists and designers for a new ceramic material and/or 'livid' glaze. This gives us a relevant and sustainable answer to a growing international demand for special applications of ceramics and glazes.